Jake Owen will join Cody Alan as co-host for a special episode of the CMT Hot 20 broadcast this Saturday (July 18) from a pontoon boat on Nashville’s Cumberland River. During their water adventure, Owen talks about his single “Real Life,” and gives fans a glimpse into what his life is like on the water, showing off his wake boarding skills. Dailey & Vincent announced they will host their own national, year-long TV series, The Dailey & Vincent Show presented by Springer Mountain Farms on RFD-TV. The series is filmed in front of a live audience at the Franklin Theatre, produced and directed by Travis Television and executive produced by Zac Koffler of APEX Entertainment Management. Scheduled to debut the first of 26 episodes Saturday, Sept. 5, 2015 at 8:30 PM CT, the shows will welcome such guests as Vince Gill, Dan Tyminski, The Oak Ridge Boys and Jimmy Fortune of the Statler Brothers. 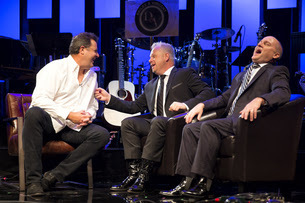 Vince Gill chats with Dailey & Vincent on set. 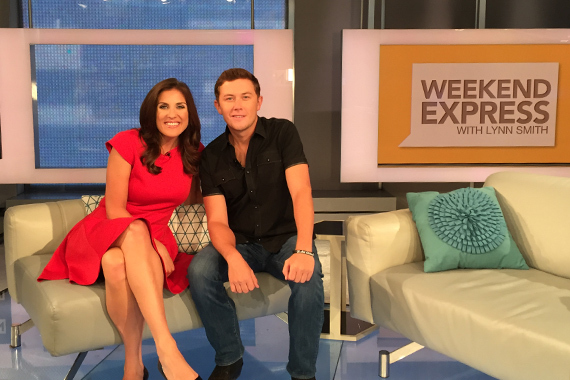 Mercury Nashville/19/Interscope recording artist Scotty McCreery will be interviewed on HLN’s Weekend Express with Lynn Smith (Saturday July 18, at 7:00 a.m. ET). McCreery stopped by the news studios en route to his concert on Friday, July 17 in Gainesville, GA.
Hall of Fame Songwriter Jeffrey Steele has debuted a video channel on Footprint.TV featuring his 2 minute songwriting tips series. Recorded over the past 10 months on his 3 Ring Circus Music YouTube channel, the videos highlight music business topics and advice from stories behind the songs to tips on songwriting. For hands-on songwriting training with Steele, his Bootcamp 2.0 is preparing to launch in the near future. View some of the video series here.